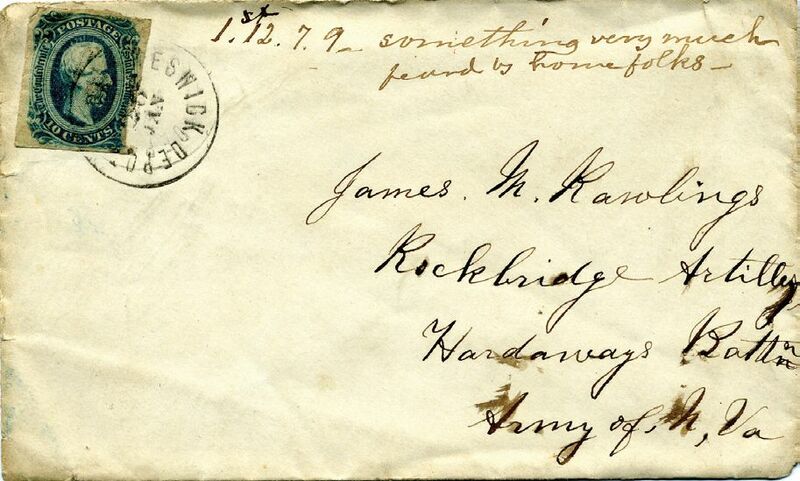 Civil War soldier records show James Minor Rawlings’ residence as Charlottesville, Virginia. He enlisted as a student at the age of 18 on March 26, 1864, and was ustered into “1st” Company of Rockbridge Virginia 1st Light Artillery. The Battery mustered out on April 9, 1865–the day Lee surrendered to Grant at Appomattox. Rawlings was described at enlistment a 5’ 9” with light complexion, grey eyes and light hair. He was born December 19, 1846 in Louisa County, Virginia and died February 1, 1898 in Charlottesville. He attended the University of Virginia in 1863 and after the War he graduated from Union Theological Seminary in 1873 to become a Presbyterian minister in Virginia, West Virginia, South Carolina and North Carolina. As I processed the batch of covers for retail stock, I flipped the cover over to check condition and to peek inside, something that is second nature for Confederate students who often find second uses on the inside, known as “turned covers”. But this was not a turned cover. It was better. At first, I thought the scribble on the back as simple doodling. Then, looking more carefully, I realized that the back of cover had a partially decoded message done in cipher with words such as “caisson, canteen, Spotteswood (Hotel? The Spottswood Hotel was a well-known establishment in Richmond), louse, pirated”, etc., as well as a numerical cipher on the face of the cover “1st.12.7.9 – something very much heard by home folks_”. Since aerial telegraphy was sometimes conducted within the clear sight of the enemy, security was a major problem during the Civil War. The Confederate Signal Corps performed duties and utilized equipment very similar to their Northern counterparts. Unlike the Union Signal Corps, the Confederate Signal Corps also conducted espionage for the South. Both services provided valuable battlefield intelligence, and sometimes artillery fire direction,but the Confederate corpsmen performed undercover missions behind enemy lines as well, acting as the Secret Service of the Confederacy, administering an information network that ran between Richmond and extended all the way into Canada. The principal code system used by the Confederate States of America government and military was Vigenère method, with a table of 26 alphabets, row shifts, and key alphabet for encipherment.. It is a method of encryption that uses a series of different Caesar ciphers based on the letters of a keyword, a simple form of polyalphabetic substitution. The Vigenère cipher has been reinvented many times. The method was originally described by Giovan Batista Belaso in his 1553 book La Cifra del. Sig. Giovan Batista Belaso; however, it was later misattributed to Blaise de Vigenère in the 19th century, but is now widely known as the “Vigenère Cipher”. The Vigenère encipherment depended upon the use of a keyword. Union codebreakers cracked the code because Confederates usually employed only a few keywords and encrypted only important words. This centuries old approach was called the “Vicksburg System” by the Confederacy. 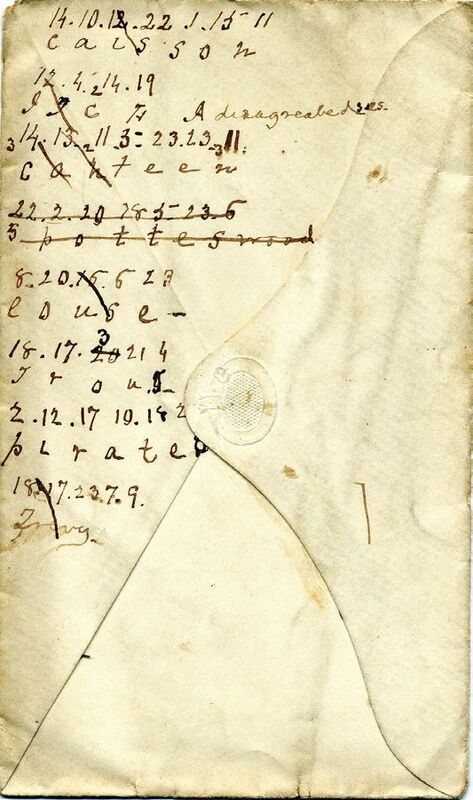 Because of transmission errors by their own cipher clerks using Morse code, the Confederate officers often had a more difficult time deciphering their own messages than did the Union cryptanalysts. Only five original Confederate cipher disks, made of brass, are known to have survived. A model of the Confederate apparatus is preserved among the Confederate records in the War Department at Washington and one of two original cipher disks was given to the Museum of the Confederacy in Richmond, Virginia by Major Graham Davis who, as assistant adjutant to General S.G. French, used it to encipher and decipher messages for his commander. The U.S. Signal Corps introduced their own cipher disk and, although primitive, there is no record that the Confederates ever deciphered a Union message that had been so processed. Whether the cipher on the illustrated cover was for military use, or more likely used for personal amusement, is anyone’s guess. Either way, it is a piece of history that captures the imagination.